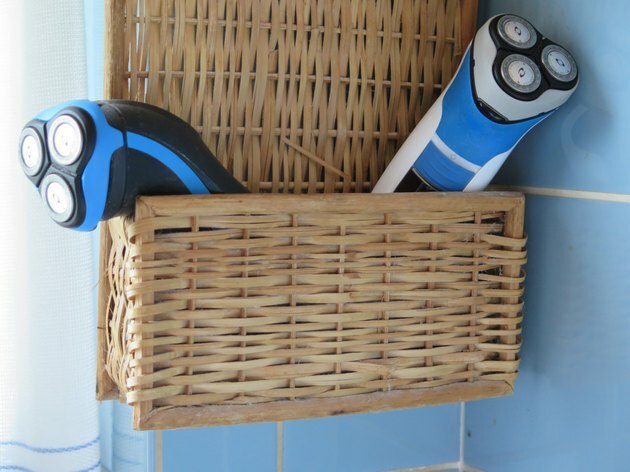 A sterile electric razor is the first step to ensuring a smooth and razor-bump-free shave. Some electric razors have built-in sterilization systems that do all the work for you. Others require just a few household ingredients -- and about 15 minutes of your time -- to get them clean and ready. Remove the foil part of your razor by squeezing the sides and set it aside. Check the manual to make sure that you remove it correctly. Use a nylon brush to remove the hairs from the exposed part of the razor. Brush the exposed cutting block and and the mechanism that controls it. For waterproof models, run water over the razor to remove any hairs that the brush may have missed. For non-waterproof models, use a damp cloth to wipe down the cutter head. Pour a small amount of rubbing alcohol on the razor and set it aside. Rubbing alcohol will evaporate quickly and will not hurt a non-waterproof razor. Reassemble the razor and allow it to dry for five to 10 minutes. Pat it dry with a cloth if you need to use it right away. Sanitize the razor over a sink for easy cleanup. Make sure that your razor is waterproof before you run it under water or pour any liquid on it.